American Heritage Girls is a Christ-centered leadership and character-development ministry. You can find its statement of faith here (a PDF file). Our girls troop meets at our church Wednesdays at 4:00 p.m.
Parents and children: You're invited to look at and enjoy photos in our brand-new AHG photo album. View it here. this year's campaign filled 70 shoeboxes! 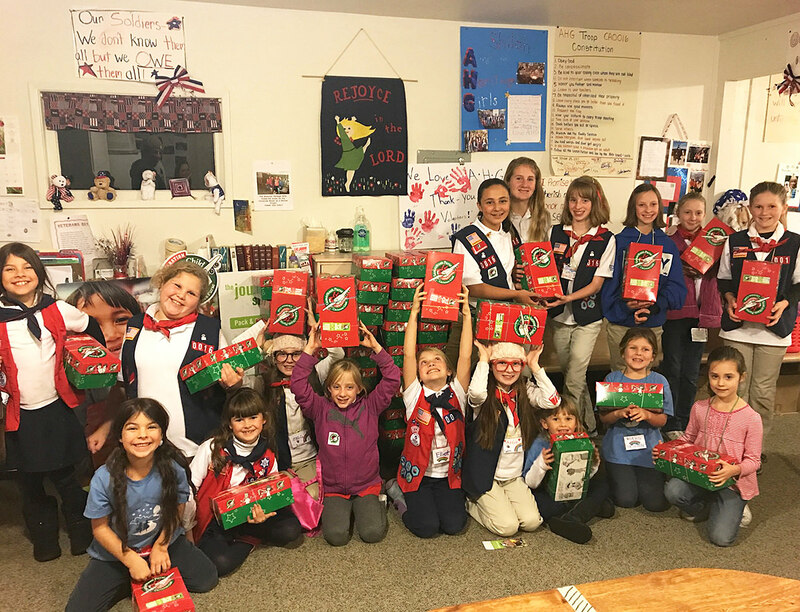 Open our newest photo album and see how many Christmas shoeboxes our girls produced during our November 15, 2017 "packing party." In our packaged boxes we donated the following: tooth brushes; combs and hair brushes; washcloths; bars of soap; deodorant sticks; nail clippers and files; reusable plastic containers such as cups, water bottles, plates, bowls, and blunt-edged utensils; sunglasses; hats; socks; T-shirts; school supplies; and underwear. to learn how to join. Today, as AHG gratefully celebrates 20 years of God's blessings, the need for Christ-centered programs is stronger than ever. Contact to learn more about joining our troop or assisting its ministry efforts. With Easter and Holy Week's fast approach, let's worship our Lord God in the community of Arnold with a new appreciation of Him. We'll have four Holy Week services this year. See when and where on this flier. Print a copy as a reminder. Our church's youth group will serve on a mission trip to Mexico this summer. Help support their effort by enjoying a spaghetti dinner fundraising event on April 27. Details here. Here's the pastor's message series titled "His Story — Your Story." You can also watch and listen to Pastor Jeff's five previous sermon videos on this page. Any girl, age 5 to 18, can become an American Heritage Girl. Girls of different backgrounds are welcome and encouraged to join! Contact to enroll in our troop.